Web analytics for the rest of us. 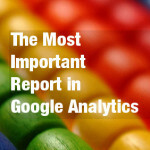 If you only looked at one piece of information in Google Analytics, what should it be? Whenever I look at a new (to me) clientsâ€™ account I go straight to this report in Google Analytics that tells me instantly how their website (and online marketing) is doing, and what needs to be done to properly set up Google Analytics. I am going to walk you through this one report: what it is, how to set it up and what itâ€™s trying to tell you. Posted in Google Analytics, Google Analytics How To and tagged Report in Google Analytics, Source / Medium by Admin Person. What does “Review your data retention settings before they take effect…” mean? Data Habits helps nonprofits and sustainable businesses make decisions about their online work based on data, not guesswork. These three techniques will help you understand web analytics and improve your online results.